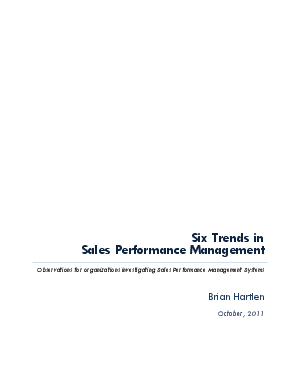 Sales Performance Management (SPM) solutions are proving to be incredibly valuable for organizations that adopt them. According to research firm Gartner, organizations that implement compensation management solutions can expect to reduce errors by more than 90%, reduce processing times by more than 40% and reduce IT/Admin staffing by more than 50%. While the majority of organizations still manage incentive compensation with homegrown solutions, or complicated Excel spreadsheets, more organizations are retiring these solutions in favor of a more flexible, customizable and streamlined incentive compensation and sales performance management system. With this rapid SPM adoption, new trends are starting to emerge. This paper discusses the top six trends influencing organizations that are considering the adoption of new software solutions to help them improve sales performance and incentive compensation practices.